Female spies. How many have you heard of? The only one I could have named before reading this book was Mata Hari. I'm not surprised that there are many more nor that they have been forgotten by history even though their contributions to war efforts have been remarkable. 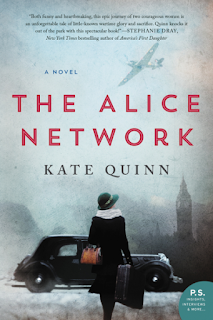 Kate Quinn's new novel, The Alice Network, brings a female run spy network back into view as it highlights the sacrifices that women made in wartime, the damage that war does, and the fierce loyalty so many women felt for family, friends, and country. Charlotte St. Clair is in disgrace. A math major at Bennington, she has disappointed her wealthy family by coming home pregnant and unwed. To forestall gossip, Charlie and her mother sail to England on their way to Switzerland to take care of Charlie's "Little Problem." But Charlie wants to use this trip to find her French cousin Rose, who hasn't been heard from since 1944, three years ago now. Charlie has made some initial inquiries and so once in England, she slips away from her mother to follow the one lead she has, landing on Eve Gardiner's doorstep in London. Eve has no intention of helping the little Yank on her doorstep until Charlie utters a name that Eve hasn't heard since the end of World War I. Eve is a broken woman. Her hands are destroyed and she spends her nights completely pickled. She's brusque and angry and imperious. But if the man whose name Charlie invokes lived past WWI, Eve is willing to use Charlie's quest for her cousin for her own reasons. The two women, plus Eve's taciturn Scottish driver Finn, head to the Continent, in search of the past. Alternating chapters tell the story of both Charlie and Eve and what drives them in their search. Charlie lost her soldier brother to suicide and blames herself for not being able to save him. She is determined not to fail again and to find and save Rose. She is frozen emotionally and it is only in her determination on this journey that she allows herself to feel anything. Eve is carefully guarding her own wartime wounds. Unlike Charlie though, Eve's war was the First World War, when young and innocent, Eve became Marguerite Le Francois, a valuable member of the Alice Network, a female spy ring in France reporting from German occupied Lille. Eve, as Marguerite, one of the fleurs du mal, gets a job as a waitress in Le Lethe, a restaurant run by a French profiteer and patronized by high ranking Germans. In serving the Germans, Eve hears valuable information she can pass on to Lili, the leader of the Alice Network. As Charlie, Eve, and Finn motor through France searching out Eve's contacts in order to track down Rose and Rene, Le Lethe's owner and the man connected to both Eve and Rose, Eve's story slowly comes out. Both Charlie and Eve are damaged and they don't really want to have to rely on the other, or anyone really. Each carries enough guilt to break them but they are both also fighters. While Charlie's story is interesting and heartbreaking, it is Eve's story, the story of an Alice Network operative and what lengths she needed to go to to uncover information that is most engrossing. Because of the alternating time lines, the story is quite action filled and the revelations that occur on the journey are fascinating. The reader is as curious about Eve's life in occupied Lille and how her hands came to be so destroyed as Charlie is. The reader is also invested in finding Rose and seeing how Charlie and Finn's growing friendship develops. The drive to know the truth makes the pages turn fast indeed. Quinn has drawn both WWI France and post WWII France carefully and the historical details of life in both times is well done. The tension in both story lines is delicately balanced and heightens in concert as the novel progresses. Tying together both World War I and World War II makes this story that much more fascinating, as does the note in the back of the novel detailing true roots of Eve's story. Historical fiction fans will thoroughly enjoy this novel of spying, betrayal, love, and hope. 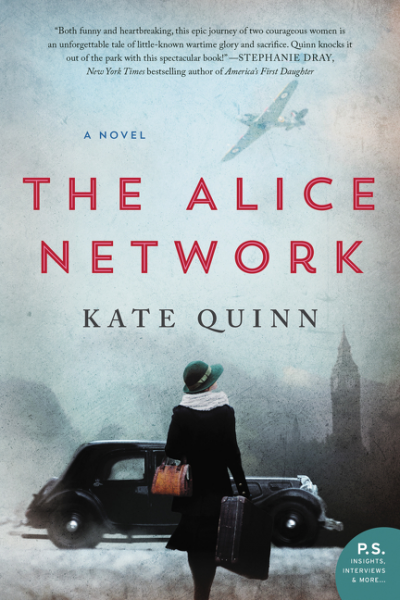 That it brings to light the little remembered fact of the Alice Network, the danger women faced as they worked for their country, and their important contributions is wonderful indeed. To hear what some of my fellow bloggers talked with Kate about, check out this You Tube video. 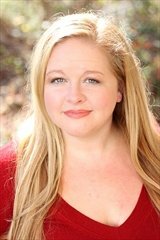 For more information about Kate Quinn and the book, check out her website, like her on Facebook, or follow her on Twitter. Check out the book's Goodreads page, follow the rest of the blog tour, or look at the amazon reviews for others' thoughts and opinions on the book. This one is at the top of my TBR list right now - I cannot wait to pick it up!